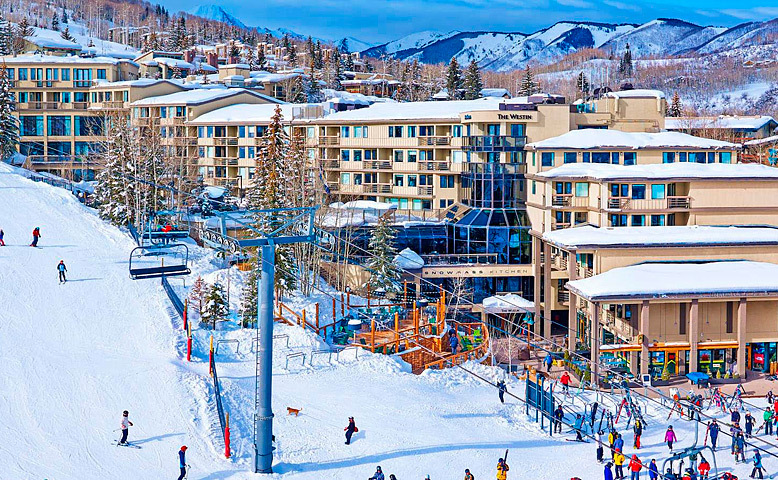 Our Snowmass Village resort offers signature Snowmass lodging amenities, excellent facilities and a variety of shopping, dining and nightlife options just steps away in the Snowmass Mall. Surround yourself in a haven of wellness and rejuvenation through innovative programs and amenities such as the Heavenly® Bed and Bath and the WestinWORKOUT® Fitness Studio. Pamper yourself in our onsite Westin Snowmass Spa and maintain a healthy lifestyle with our SuperFoodsRxTM menu. A perfect complement to the year-round mountain recreation and the cultural amenities available in the world-class destination of Aspen Snowmass. Snowmass Village is in the center of it all! Surrounded by majestic peaks in a natural playground second to none, you’ll revel in the beauty and active lifestyle of this world-class mountain destination. As one of the finest ski resort areas in the United States, Snowmass Mountain activities range from cross country skiing to snowmobiling, and more. Be sure to take advantage of award-winning ski and snowboard schools – or soak in the slope-side hot tubs and take in the vista views. You are sure to find something the whole family can enjoy during your stay in Snowmass. Located in the Alpine Wing, the Alpine Rooms feature a contemporary design and 340 sq. feet of living space, with armchair and side table, and 42-inch flat screen LCD TV. Enjoy restorative sleep so you wake up at your best with a king sized Westin Heavenly Bed® with signature pillow-top mattress, crisp linens, and a lofty duvet. The bathrooms feature vanity and Heavenly Bath rainforest walk-in shower in each king room or rainforest shower/bathtub combination in the double queen room, which will enhance your morning rituals and offers welcome respite after a long day. White Tea by WestinTM bath amenities add bliss to your bathing routine. Business is effortless with a comfortable work desk and chair, High Speed Internet Access (for a fee), and a data port. A convenient tea and coffee maker and mini refrigerator provide a comfortable environment while you work. For those seeking a typically quieter and more private setting, away from the activity of the lobby outlets and the adjacent Mall, the Alpine Wing of our Snowmass hotel offers the perfect setting. The Alpine wing primarily features guest rooms with one king bed, larger decks on the balcony rooms, and some of our finest ski-in/out accessible suites in the in the hotel. Other amenities located in the Alpine Wing include the Westin Spa and the Westin Kids Club. From the main lobby, the Alpine Wing may require multiple elevators and additional walking time to access your guest room. Additional persons in the room will be charged an additional $25/person/night. Cancellations: If the reservation is canceled within 30 days or you are a no-show or depart early, you will be charged for your complete stay. Aspen’s Sardy Field (ASE), located just three miles from Aspen and eight miles from Snowmass Village, is the most conveniently located ski resort airport in the world. Up to 200 flights per week offer reliable, same-day connections from points across the globe. The Westin Snowmass Resort is situated in the town of Snowmass Village roughly five miles from Highway 82 and seven miles from Aspen/Pitkin County Airport (ASE). Convenient bus and shuttle services, private car services, and rentals for round trip transportation from the airport are readily available. Reservations are highly encouraged. Guests traveling to Denver International Airport (DEN), can enjoy a scenic 3.5-hour drive through multiple mountain passes on Highway I-70 in a rental car or via airport shuttle. From the resort, it’s easy to explore the area. Snowmass Mall offers world-class shopping and dining and is located within walking distance. The resort shuttle also provides transportation into and around the village, and bus, taxi, and private car services connect you to downtown Aspen for cultural activities, nightlife, year-round recreation, and more.